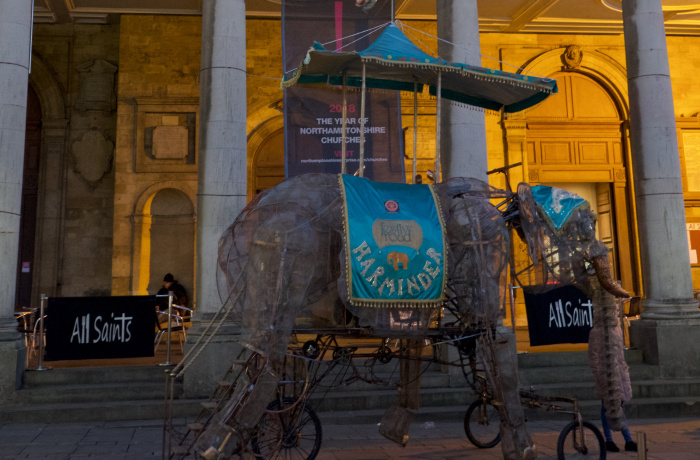 Harminder is Festive Road’s impressive, larger-than-life mechanical Asian elephant. Pedal-power brings her to life, with her ear, head and trunk movements adding to the spectacle as she perambulates. She loves nothing more than packing her trunk and going to new places and making new friends! In addition to her pilot, she has a special platform on her back where a dancer can perform, or where she can carry a VIP guest. She also has an on-board music system, as well as lighting for evening events. She requires reasonably flat ground- no cambers or hills! She will cycle along happily on grass areas, flat fields, city squares and standard road surfaces. We are currently working with partner organisation to create a show around Harminder ....... more details shortly!